I recently moved, and with that, comes an endless list of stuff that is missing. On that list was a clock. Now I like quirky stuff, so simply buying one won’t do. I was introduced to a certain concept of clock years ago, and finally, with enough incentive, I thought I’d give it a go. This concept is the Hand in hand clock. A clock where the hands are on each others ends. The minute hand is at the tip of the hour hand, and an optional second hand is at the tip of the minute hand. 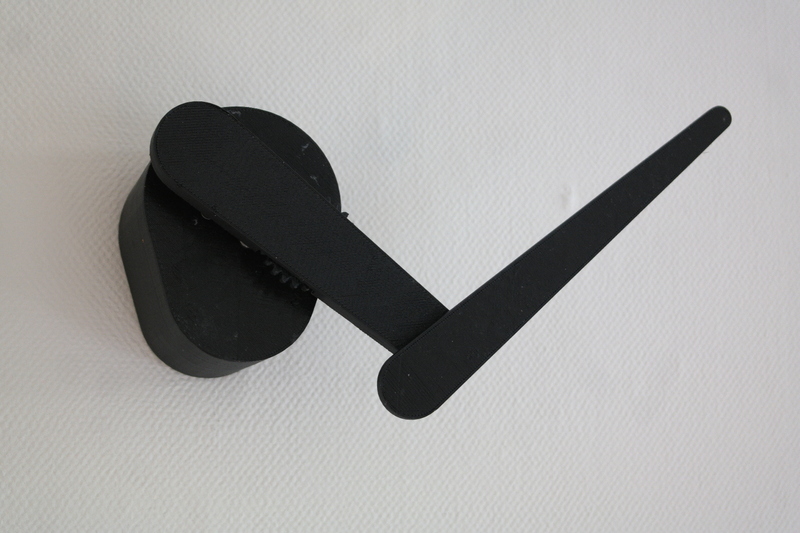 The hand in hand clock I designed is fully 3D printable, requires no support material and can be printed on most basic 3D printers. The only part that needs a 200×200 printbed size is the minute hand, but all other parts can also be printed on smaller printers. It can be printed in around 10 hours for 200-300g of plastic. It is driven by a thin NEMA17 stepper motor, controlled by a pololu A4988 stepper motor driver. It can be controlled by any microcontroller with more than 5 I/O’s (in my case, a 5V trinket). It runs of 9V and the power consumption is around 0.5W. Download all the files to make the clock yourself below. In the files there are all the STL files to print the clock, a printed parts glossary, the firmware for the clock, and a simple schematic to make the clock driver. Source files, containing solidworks 2014 files and Step files, can be found on the downloads page. To make it, follow the link to the instructables page, where there is a guide with lots of pictures on making the clock. Is there a file or drawing with the gear size´s? I dont have a 3D printer but like the design and want to make the clock from other materials. The gears have their size information in their name. What exactly do you need to make it yourself. I might be able to make something to help. This is abeautiful clock design. Thanks for sharing it. I am wondering what software tools you used to design the gears?